It takes a few days to notice. At first the barrage of colour and noise and sheer sensation is enough, but it will hit you eventually, an absence on your visual landscape of something that you have been bombarded with for your entire life: Advertising. Here, there are no billboards with bursting pectorals and flash cars urging you to become thinner, richer, better, fitter, harder, faster, more beautiful and desirous of every impossible ideal. The Coca Cola red screen, the Starbucks’ green siren and the yellow “I’m lovin’ it” M do not form the color code of your city panorama. What you get instead is equally prevalent: political, state-commissioned murals. They’re both propaganda of a sort, working towards different ends through the medium of manipulation. They’re in every barrio, in every town, along desolate back roads, weathered and lovelorn in empty fields and freshly painted on city signs. 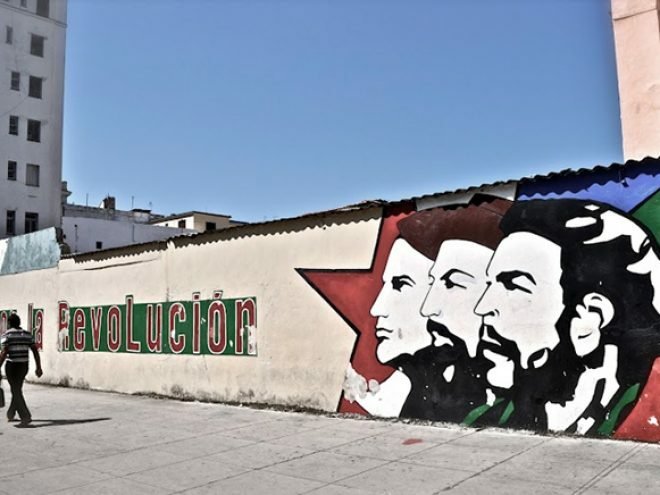 They are a way for the state to communicate with the people and for the regime to reinforce the “triumphs of the revolution.” But what would Che think now to see his face used in such a way? A commodity to be sold to the masses and a symbol of an outdated ideology? Unlicensed graffiti however, has only really emerged on the streets in the last decade, apparently since some foreign street artists exhibited at the Biennial Art Festival starting a trend. Official bodies were quick to condemn any work created without State approval; these images were not art, but mere vandalism. But the images persisted, as young people dared to stamp their voice over the state-smeared walls. Street art is like a mind map to the nation, where a surface engages in debate and another answers back. It is a medium of empowerment. Their spray cans are their voices, a weapon the state are just as quick to confiscate and silence.